Your bridesmaids will be doing a lot to support you already, and as tough as it is to talk about costs, it is a must. Establish from the beginning what they are responsible for, and what you’ll be covering – then hopefully there will be no awkward arguments on the lead up to your wedding! Hen party costs are also up to the bridal party – although they can split this between them and still give you the best pre-wedding party of your life! Travel and accommodation are the duty of your bridesmaids to organise and pay for. However, you could help them out by booking a block of rooms at a discount price, or if your venue is far away, you could arrange a large group of you to travel together to cut down the cost. 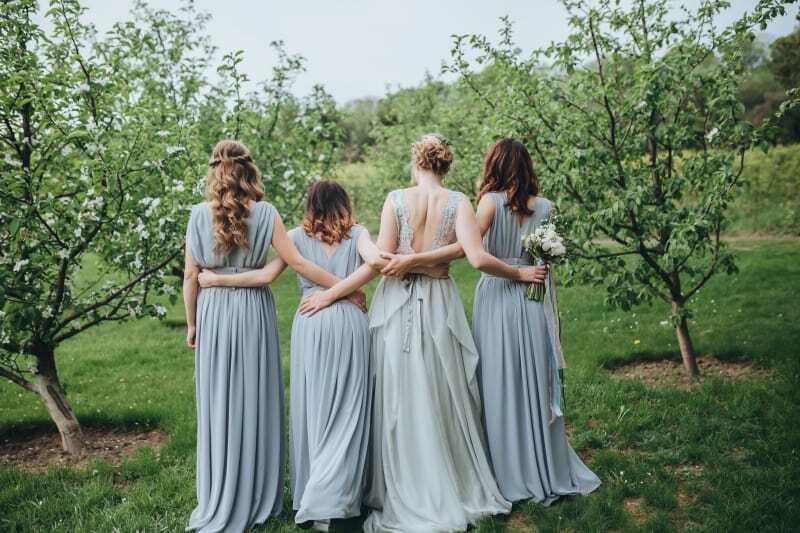 If your bridesmaid chooses to give you a wedding gift (and they may not as they’ve already spent a lot of money and effort on your wedding) the cost is up to them. It may only be something small, but it will be a lovely keepsake of them accompanying you on your big day. If you choose to have your bridal party stay with you in your hotel suite on the eve of your wedding, that is your responsibility and should cover the cost of this. Transportation on your wedding day is also up to the bride and her family to pay for. Your bridesmaids will have enough to think about on the day, so do them a favour and arrange how they’ll get from altar to reception. Hair and makeup is a tricky one. If you’re not that fussed, let them do their own hair and makeup to save costs (they will look stunning anyway!) – but if you specifically want a glamorous look for your bridesmaids, you will have to pay for this. Alternatively, if your bridesmaid having a diva streak and wants to hire a professional without you requesting, let them cover the cost – or you could split the bill in goodwill to keep them sweet. A sneaky tip to save the hassle of deciding this altogether is to find a friend or family member who has makeup or hair experience and ask them to do it on the day as a favour to you. Want to find the perfect wedding dress? Look no further! We have compiled a list of our favourite places to get your special girls their dresses: Click here to see! Did you like this article? There’s more!